Home / Index category / Nikola Karabatic reached 300.000 fans on Facebook! Nikola Karabatic reached 300.000 fans on Facebook! Social networking become essential part of popular handball players everyday life. French star, Nikola Karabatic shows how you have to work with your fans on Facebook. Two days ago he reached 300.000 fans, what put him on the first place among handball players. ← Previous Story Ivan Pesic to Maribor Branik! 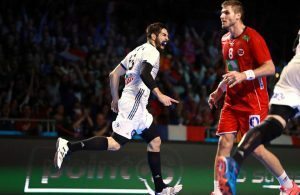 GO FOR 5TH GOLD: Nikola Karabatic to replace Cedric Sorhaindo!